Shoes. I hadn’t seen a pair for years, not proper, shop-bought, complete shoes that had a hope of keeping your feet dry. I remember the patent red pair that Mum had bought me as a little girl. I had loved those shoes, loved how they reminded me of cherries. I could barely remember the taste of any fruit, not any more. Yet still my mouth watered at the thought. I shielded my eyes from the fierce sun as the shoes danced back and forth, tantalizingly. 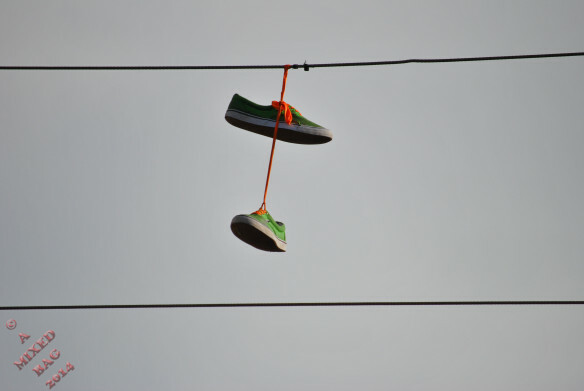 I bet the wires from which the shoes dangled hadn’t carried messages for a decade. My feet ached for those shoes. I had made up my mind to retrieve them when a rogue cloud covered the sun. The land around me lost its bleach and I saw that the hillock on the ground was more sinister. It was the remains of a man, long dead, his arm reaching up in a last attempt to gain his prize. This was a trap. No doubt there were live wires buried in the telegraph pole, ready to pass on their own message to us rebels. We will kill you all. Not me, not today, I thought. This is so well written, Love the memory of the red shoes, scary at the end with the thought of the buried live wires………thanks for your visit to my blog. You asked about Pup – he was part wolf, and a total Character! Thank you for telling me about Pup – he looked like he was a gorgeous creature. You must have some wonderful memories of him. aloha Freya. a devious plot. i’ve lost interest in retrieving those shoes as well. ha. cool read. aloha. I’m glad you enjoyed it! Yes, those shoes will be staying where they are…. Ooh, this seems to have a dystopic scifi element to it. I like that. Cool that she figures out the trap, but who set it? You’ve got me curious and interested. I like the contrasts between memories and her present. Love the dark ending. Sounds like the start of a longer story. The potential is certainly there! A fine piece of paranoia fiction. Interesting metaphor – shoes making one’s mouth water. Thank you, Patrick. Yes, shoes don’t normally do that, do they! AnElephant likes a good laugh. He does not get one in this darkly intriguing tale of a bleak future.